Despite advances in machine gun, mortar and grenade technology, all remained relatively unwieldy and cumbersome in comparison to the rifle, which remained the most crucial, ever-present infantry weapon throughout World War One. The difficulty with these former weapons were their unwieldiness. While the infantry moved forward during a raid or attack the machine gun invariably proved impractical, both in terms of managing the machine gun itself but as much for the weight of the rounds of ammunition required to keep it serviceable. As for the mortar, the fact that it was a one-shot weapon reduced its effectiveness. Grenades certainly had their role during a raid, but carrying buckets of supplies quickly proved tiring, and supplies generally ran out quite quickly. Curiously, despite the intense interest in enhancing rifle capabilities in the years immediately preceding World War One no real developments were introduced during the actual war years - when ordinarily the reverse would be expected to be the case. Rather, the key armies were chiefly concerned with ensuring that manufacturing of existing (adequate) models was kept at a high pitch. Research and development tended to be dedicated to other areas such as artillery, mortars, grenades and poison gases. Much has been made of the 15 rounds per minute achieved at Mons by riflemen of the British Expeditionary Force. However these were highly trained soldiers of what was then (August 1914) a professional army. The flood of entrants to the New Armies - of all nations - could not hope to achieve such a sustained accurate rate of fire. The norm was perhaps eight to twelve rounds per minute. In terms of range, the average during the war was around 1,400 metres, although accuracy could only be guaranteed at around 600 metres. Sniping as a military practice had proved its worth through the ages, but it was given an added importance in conditions of trench warfare. Working day and night, trained marksmen would function essentially as assassins, often targeting any moving object behind enemy lines, even if they were engaged in peaceable tasks (which meant that if a sniper was taken prisoner he could expect no mercy, on either side). Snipers were by no means specific to the Western Front; their talents were employed on all fronts, including Gallipoli, Italy and Africa. Although the overall number of casualties claimed by snipers were small (although many snipers kept count of their number of 'kills', often reaching triple figures), they played an important role in sapping enemy morale. 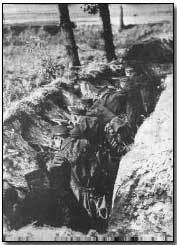 Soldiers knew that they could not walk about freely along exposed trenches; anyone unwise enough to peep above the front line parapet could expect a well-aimed bullet in the head - as often happened. The types of rifles used by snipers varied, and included the Lee-Enfield on the British side and, on the German, wide usage of the Mauser rifle, whose fitted optical sight rendered it ideal for the purpose. Given the relentlessly high demand for any and all forms of offensive weaponry during the war - particularly during its earliest days when armament production was only beginning to accelerate - many different types of rifle were pressed into service, including a fair number of ancient models. However for the most part a core set of models were relied upon by the key belligerent armies. The standard weapon in the German army, the 7.92 mm Mauser Gewehr 98 was designed (as its name suggests) in 1898 by Peter Paul Mauser (1838-1914). Somewhat superior in design to the majority of its contemporaries, it incorporated the clip and magazine into a single detachable mechanism, saving valuable loading time. It suffered however from the disadvantage of being unsuited to rapid fire (on account of its bolt arrangement), and was limited by a five-cartridge magazine. Nevertheless it was a thoroughly dependable, well tested and accurate weapon, and with its fitted optical sight, ideal for use in sniping. Unlike the Mauser the Lee-Enfield, with its ten-cartridge magazine, was well suited to rapid fire; a suitably trained soldier could expect to fire twelve well-aimed shots a minute. The Lee-Enfield proved so sturdy and reliable that its use continued into World War Two. Its design was also incorporated into both U.S. and Canadian models. Just as the Germans adopted the Mauser and the British the Lee-Enfield, so the French opted for the Lebel 8 mm weapon (officially titled the Fusil modele, produced in 1886, and which unusually fired smokeless cartridges) as their rifle of choice during the war years. Despite its wide use it suffered from a marked practical design flaw. Its eight rounds were loaded, nose to tail fashion, in a tubular magazine placed under the barrel of the rifle. This resulted in slow loading since the operator had to be wary of one round hitting the primer of the cartridge in front, thereby causing a most unwelcome explosion. Although a better French model, the Berthier (see below), was available from 1916, the Lebel - despite its flaws - continued to be standard issue. As indicated above, the French discovered a serious practical defect in their standard issue Lebel rifle. Thus, two years into the war, the Berthier was issued as an improvement. Officially titled the Fusil d'Infanterie Modele 1907, Transforme 1915, the replacement rifle was, like the Lee-Enfield, clip loaded. The differences with the Lebel did not stop there however. The rifle's sights were different as was its bolt mechanism. A fine weapon, the original Berthier (designed in 1907) nevertheless suffered, like its predecessor, from a design flaw - its magazine held only three rounds. A modified version, produced in 1915, increased this to five rounds. The result was the Fusil modele 1916, loaded from a six-round clip or charger. Immediately popular demand was such that certain supplies of the model were produced in the U.S. by the Remington company. A carbine (i.e. short-barrelled) version of the Berthier was produced in 1916, titled the Mousqueton modele 1916. Carbines were generally preferred by all armies as being somewhat less unwieldy than longer barrelled rifles. Indeed, the move towards carbine development was perhaps the only notable advance to rifle technology during the war, although other modifications for trench conditions were undertaken, including the fitting of periscopes and tripods. The Springfield, manufactured in the U.S. (at Springfield, Massachusetts), was the standard wartime rifle of the U.S. army. It was reliable and produced in a short-barrelled version for issue to the American Expeditionary Force. In short supply however around half of U.S. soldiers in the field were issued with the M1917 'American Enfield'. The performance of the U.S. rifle was comparable to the British Lee-Enfield, and was also produced in a Mk1 automatic version. The Springfield utilised a licensed Mauser action. Derivatives of the Springfield remained in use until the Korean War. Produced in Budapest and Steyr (in Austria), and known as the Repetier Gewehr M95, the standard issue rifle of the Austro-Hungarian army was first produced in 1895. Considered a strong design, the Repetier Gewehr M95 withstood a so-called torture test of firing 50,000 rounds through a single rifle without lubrication of any kind. It was consequently produced in huge quantities during the war. At one stage during the war the Austro-Hungarian army gave consideration to using the German Mauser rifle in preference to the Steyr-Mannlicher, before concluding that it was inferior in design to their own weapon. This model was also subsequently used in large quantities by the Italian army (as World War One reparations). Click here to read an article on the Canadian Ross rifle. Photograph of SMLE courtesy of GreatWarAZ.